Just thought I would have a dabble with a male card. but something we really don’t seem to do until we have to. 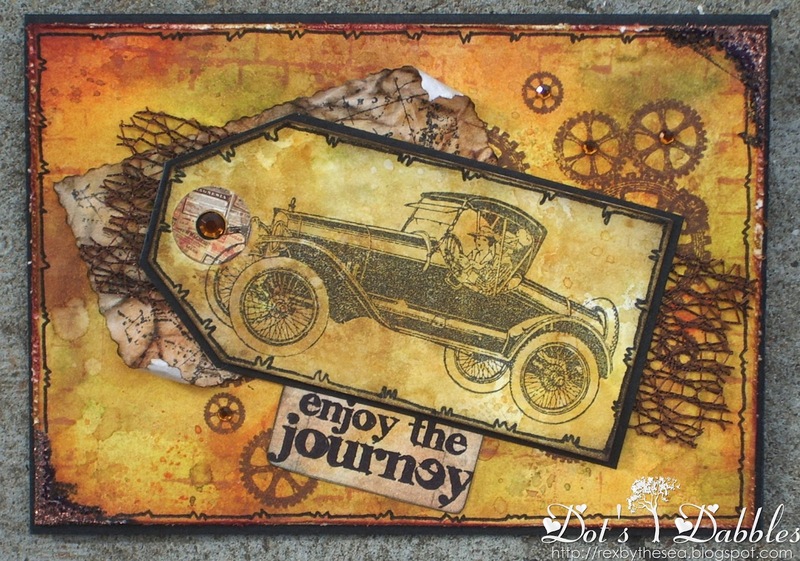 I had so much fun with this card, mucking around with colours, cogs and cars. The background is distressed in a very TH sort of way and is set off with a little EP. The border is just doodle drawn with a fine liner…an idea I have gotten from Ellie at Fashionable Stamping Challenges. and makes a wonderful embellishment for this travel piece. Fantabulous masculine card! Thanks for joining our CropStop Monochromatic Challenge. Dot, Love that song, so perfect for this awesome card! Great masculine card and the colors are some of my favorites! Happy Saturday! What fabulous, rich colours! Beautiful! Your card is awesome. I just love the image and you did such a great distressing this manly card. Thank you so much for joining in my DL.ART Thankful Thursday challenge. Super monochromatic colour scheme. Perfect for this masculine card. You did a very nice job. Thank you for entering this week's challenge at Card Crafter's Circle. This is a great card Dot and perfect for a man! I love the distressing and monochrome colour scheme. Thanks for joining in the fun at Lexi's Creations this time … hope you'll join us again! Fabulous male card and it is really nice to see that you actually enjoyed making it! Wow, I really love this wonderful male card, fantastic images and details. Fabulous male card, love the distress vintage colours. Thank you for sharing it with us at CCM this time. I love it, so perfect for our challenge. Thanks for joining us at Crafts4Eternity Travel challenge. Love your card and tag perfect card for men,thanks for joining us at Cupcake this week and good luck. A lovely vintage card, perfect for a guy. Thanks for joining us this week at CCC. Such a lovely card, I really like the background you've created and the map looks awesome. A great vintage card. Great card. I really like that. Glad you could join us at Totally Papercrafts this week. This looks as though it has been created so easily Dot and is a fabulous card for a man. I love it. The Stamp Man also has a male theme at the moment. Love all the different elements, what a great masculine card! And I am completely envious of your doodling, I have yet to try anything other than dots and dashes and yours suits your distressing so well. Thank-you for sharing with us at The Poodles Parlour! To me your card reminds me of Tim Holtz style..your music told me to "Hit the road Jack" Hope you are able to come back to Card Crafter's Circle. This is a lovely card – very masculine but not over the top at all. Lovely for any age. Great card, Dot… love those colors! Wonderful masculine card!!! Thanks for playing with us at CropStop! Fabulous man card Dot you do colours so perfectly everything matches brilliantly.